1706, Queen Anne, Stuart family. "This unique atlas testifies to both the love of splendor and the interest in science of Augustus the Strong (1670-1733). Produced for him in Amsterdam in 1706-1710, the nineteen large-format morocco volumes contain roughly 1400 beautifully colored printed or hand-drawn leaves (maps, views, plans, portraits) of Dutch, French, Italian, English and German origin dating to the seventeenth and early eighteenth centuries. Volume I, on display, contains seventy masterfully tinted engravings depicting English royalty and court dress around 1700. 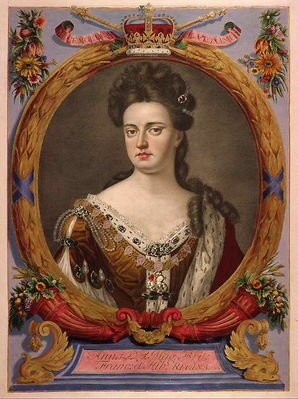 Название произведения: 1706, Queen Anne, Stuart family.